When it’s already time for the holidays, it also means that Christmas parties are being held almost in every corner of the street you can find. Restaurants, hotel function rooms, bars, pubs, and even cafes are booked for corporate parties, family reunion parties and university students parties. 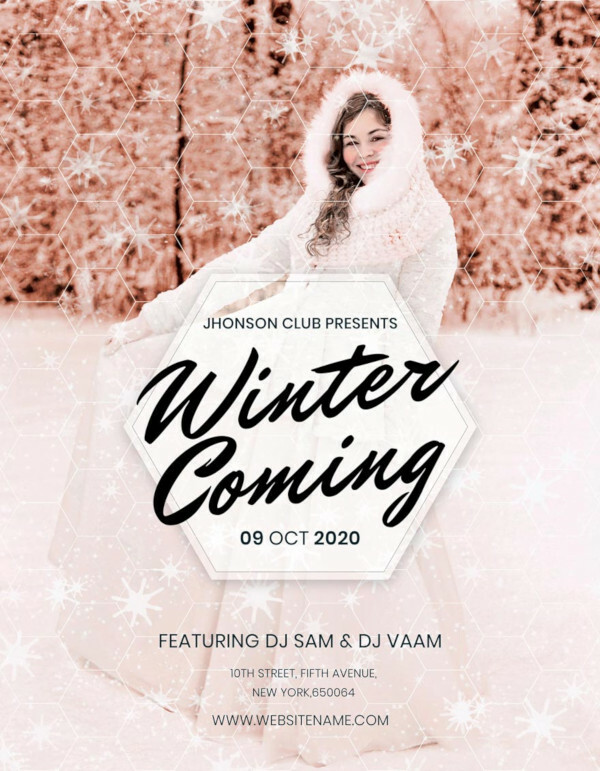 It is, perhaps, the biggest social event all year round and it is the highly anticipated event marked on our calendars. 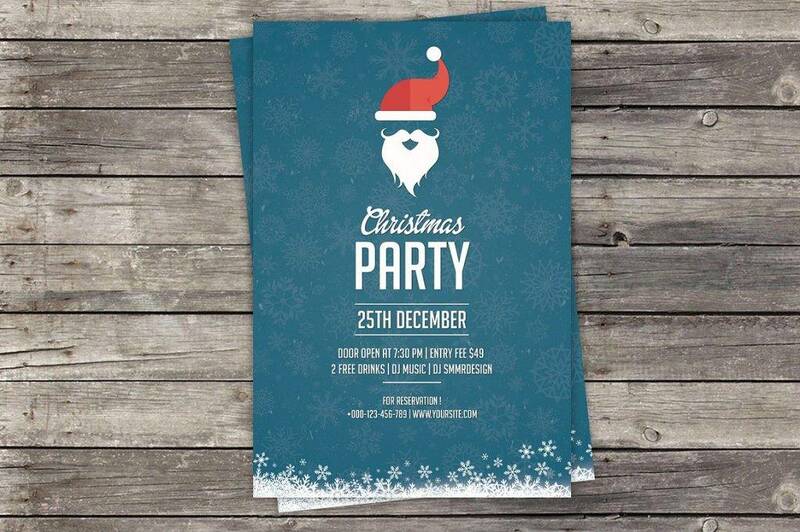 If you are planning to hold a big Christmas party, you can put a hype by making use of advertising flyer such as the use of flyers. Sure, it is true that in this time and generation, we make use more of the digital media to spread the word about any event. However, you would actually stand out if you would be using the traditional way; people would be more drawn to it like with the hype of photo editing applications with features and filters using the old camera film. 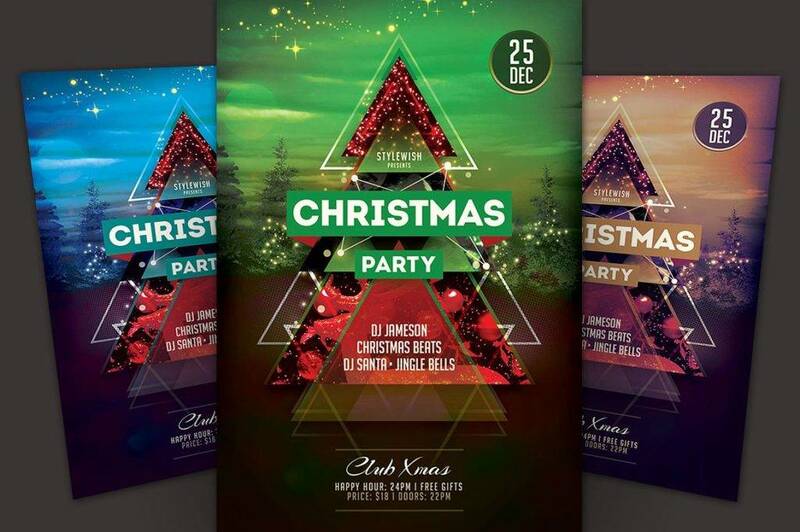 Using party flyers might sound to old school but in this time and generation where everything seems to be digital, your Christmas party flyers will surely stand out especially if you are creative and unique with your Christmas party flyer design. 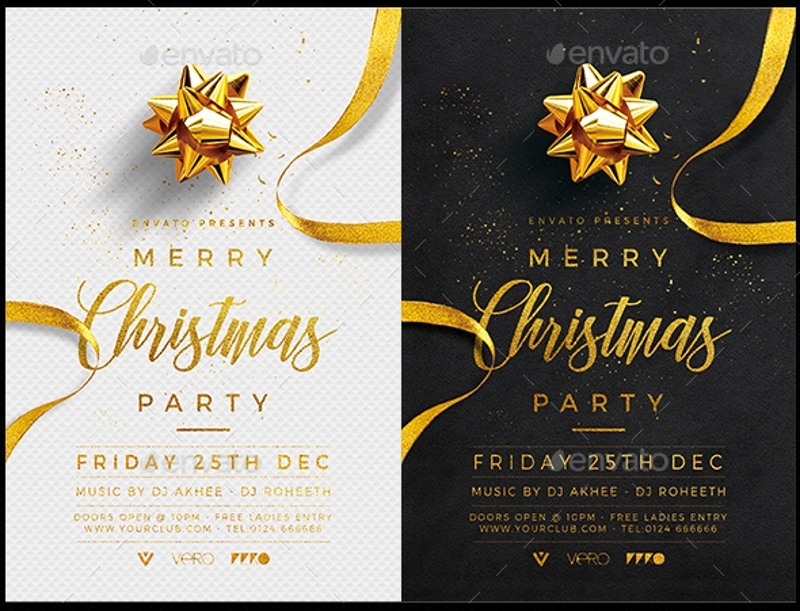 For some, designing for a Christmas party flyer can be pretty easy since you all have to do is to put on the festive vibes and you’re all done. However, there are also some people who would find it overwhelming. Like that of cooking a dish, the layout the color, the text, and the imagery which are the ingredients in creating a flyer should be incorporated well so that it will be pleasing to the eye of the receiver of the flyer. When you create a Christmas party flyer or any kind of flyer that exists, you would need to know what the ingredients are to a beautiful Christmas party flyer as well as the recipe or the way on how you can blend and incorporate these ingredients or elements well to create a Christmas party flyer that everyone would love to receive, see, and read. you may also see DJ flyer. The obvious Christmas colors are the colors green and red. You might think that all you need to do is to overload the colors green and red on your design and you’re set but that’s a wrong idea because that technique is way too common and too much red and green can be overwhelming to the eyes of the beholder. Why not incorporate some colors into the usual green and red combo like white or gold. But the thing about Christmas colors nowadays is that it is more versatile. People are now getting risky with their chosen Christmas colors. They would now use blue, all-white, silver, gold, and yes, even black has become a Christmas color. Any color can encourage the yuletide cheer as long as it is added with sparkly elements and other Christmas decors but that’s another ingredient that will be tackled further in this article. 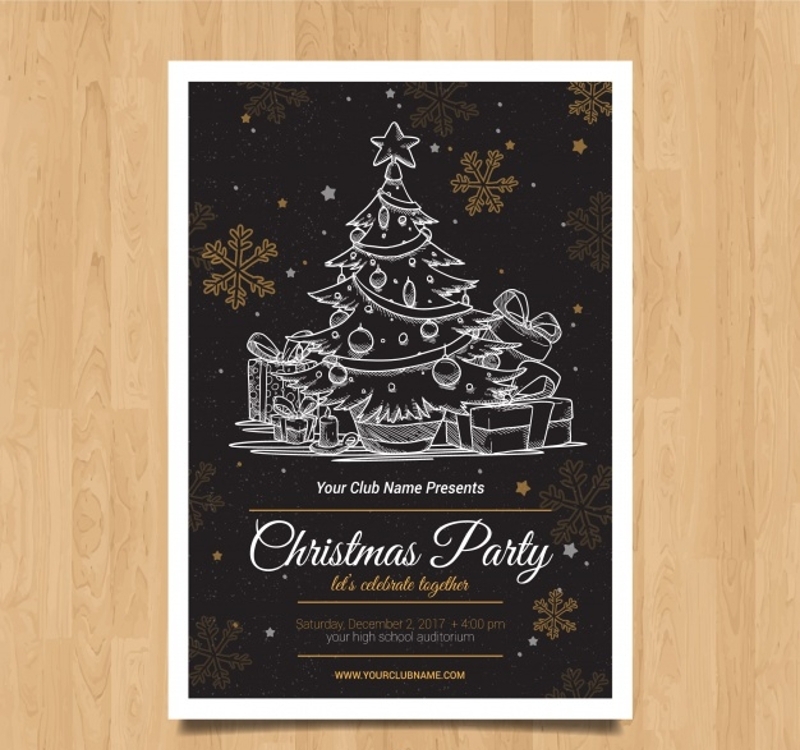 Do not overwhelm your Christmas party flyer layout with a lot of contrasting colors because that might overwhelm the receivers of your flyers. 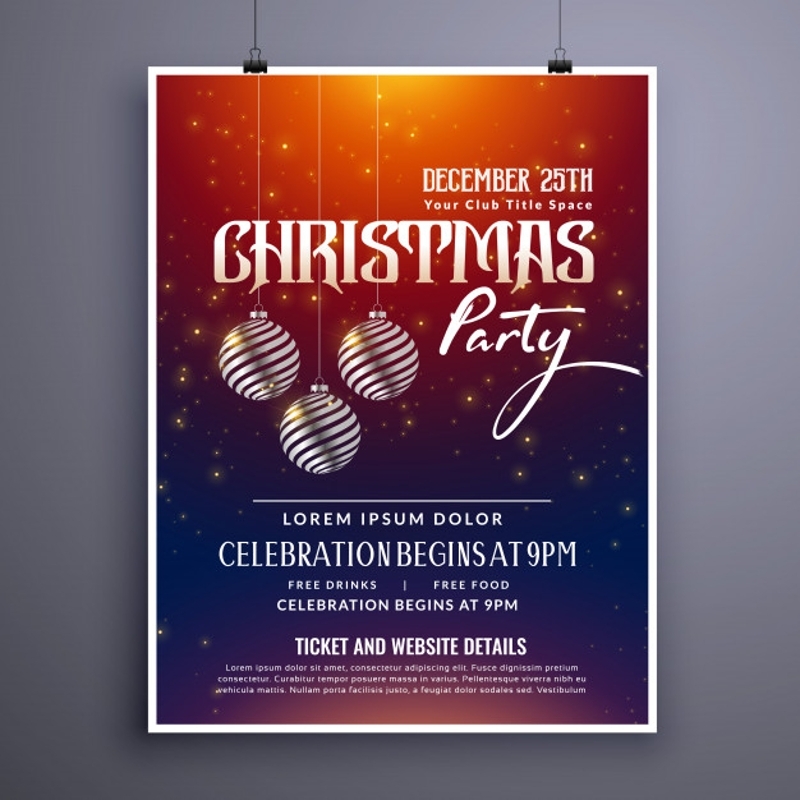 The typography, which is defined as the act or procedure of organizing the style and appearance of any printed matter, is important in a Christmas party flyer design. 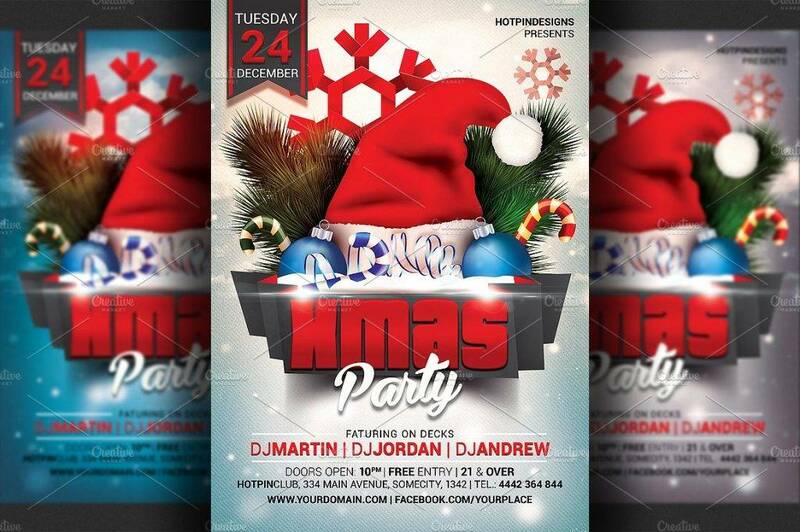 There are some Christmas flyers out there that would only be using an image in its layouts out there however it is a different case for a Christmas party flyer since it is packed with details and flyers are supposed to give information and that defeats the purpose for giving out flyers since club flyers are made and given in order to inform the attendees of a certain event. 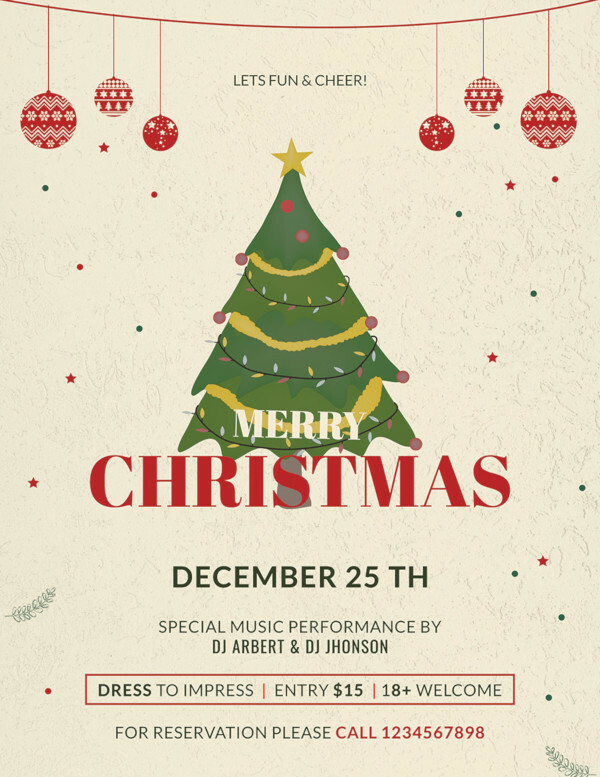 The thing you need to look into the typography of a Christmas party flyer design is the font color and the font style used. 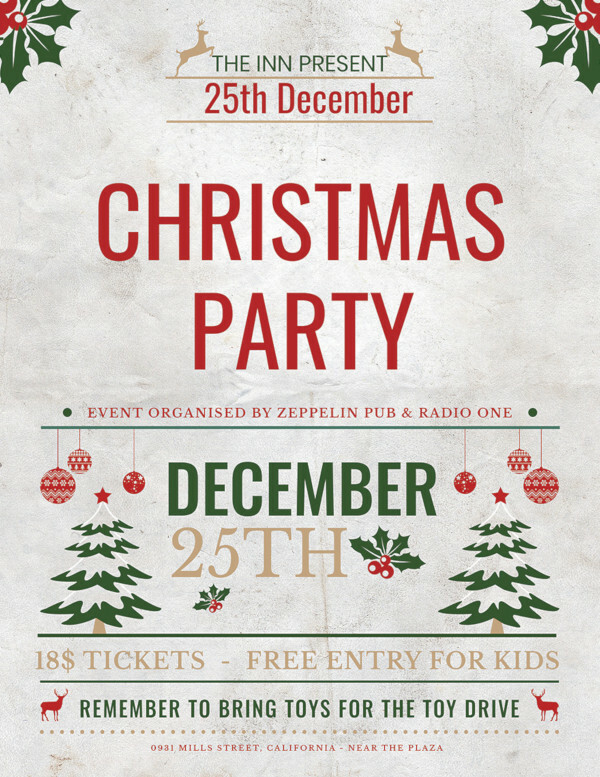 Usually, Christmas party flyers would have a big inscription of a “Merry Christmas” on the layout. 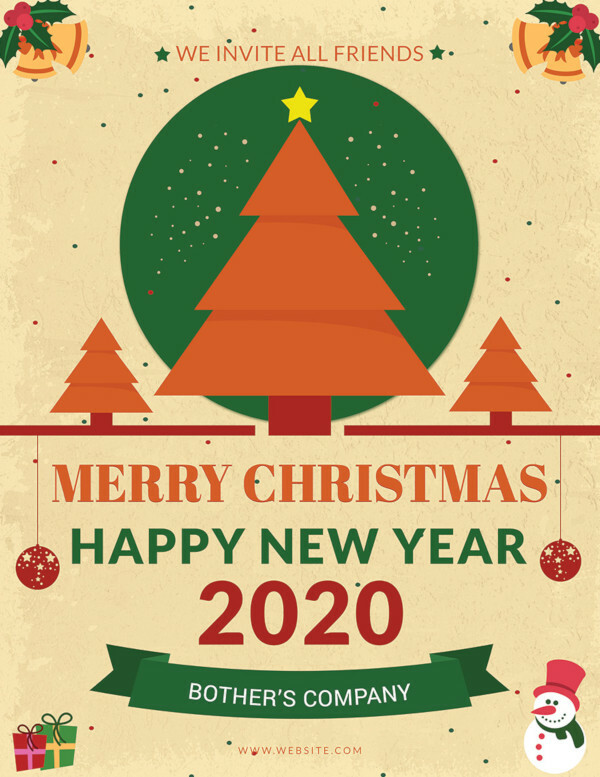 That is the part of the typography wherein you could go festive on the text and make use of fonts that are equally festive. However, you should never go overboard with the fonts used in the parts where you would give the details of the event such as the 5 w’s–who, what, where, when, and why–and the 1 H which is the how. 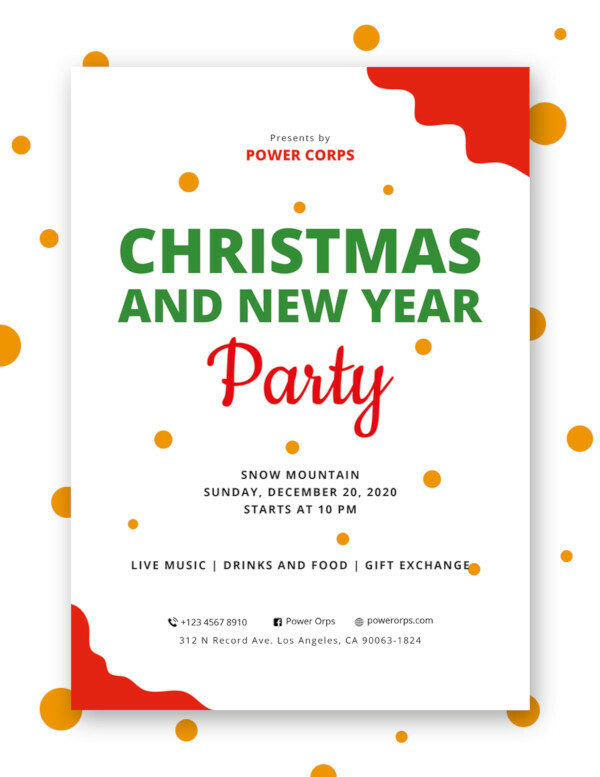 It is important to use a simple font style and readable font color for that part of your Christmas party flyer so that the people or the attendees that will be receiving and reading your Christmas party flyer wouldn’t have any misunderstanding regarding the details of the event you are inviting them to. 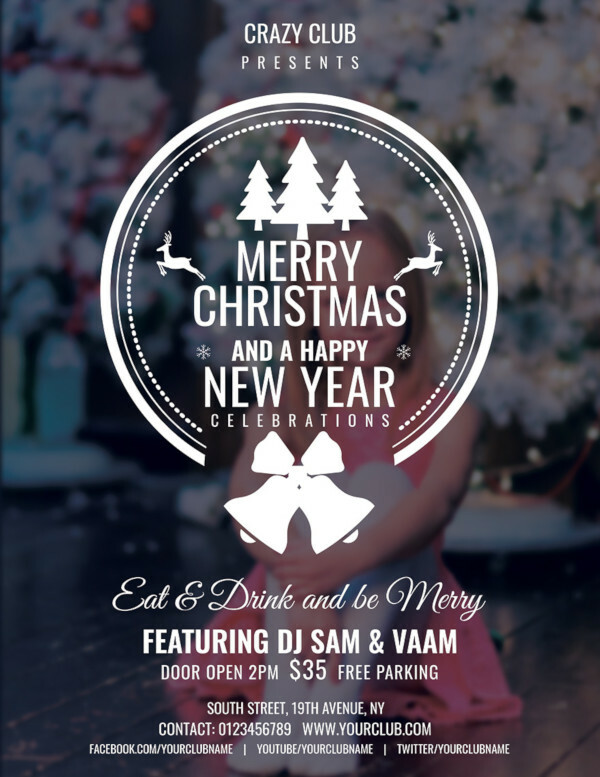 Imagina an attendee getting lost because the font style you used in the details part of your Christmas party flyer is not readable and it led her to a different venue. 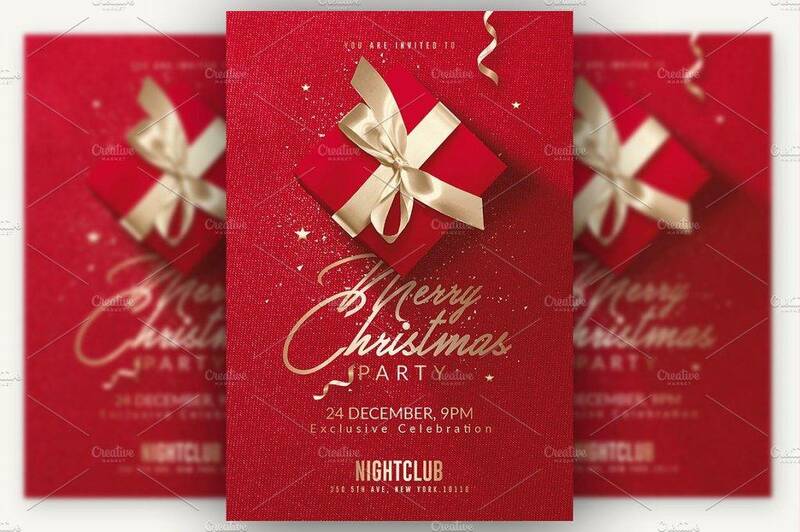 There are some flyers, when the typography has been invested with time and effort by its designers or creator, would not anymore need any imagery since the way the text is organized on the Christmas party flyer is enough to encourage and entice the people to attend your party. 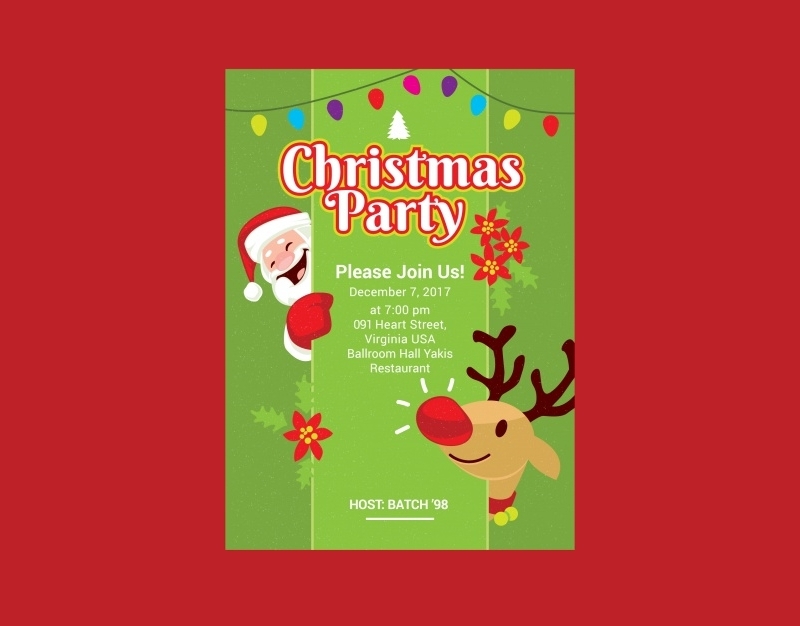 The usual imagery you can usually find on Christmas party flyers is Christmas decorative items such as Christmas trees, balls, stars, Santa Claus and the reason that we have Christmas, Jesus along with Joseph and Mary in the manger. 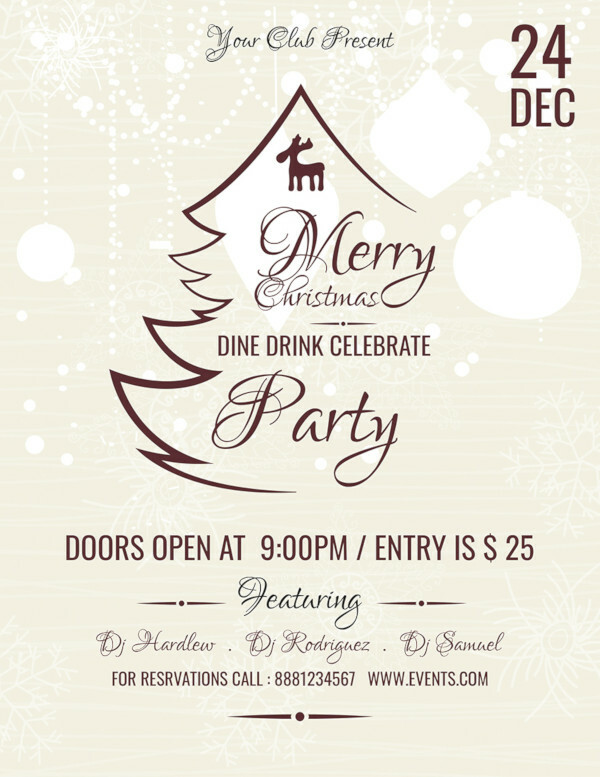 And since it is a Christmas party flyer invitation, you can always include people who are partying in your layout design so that people, even at a far glance would immediately identify that you are inviting them for a party. 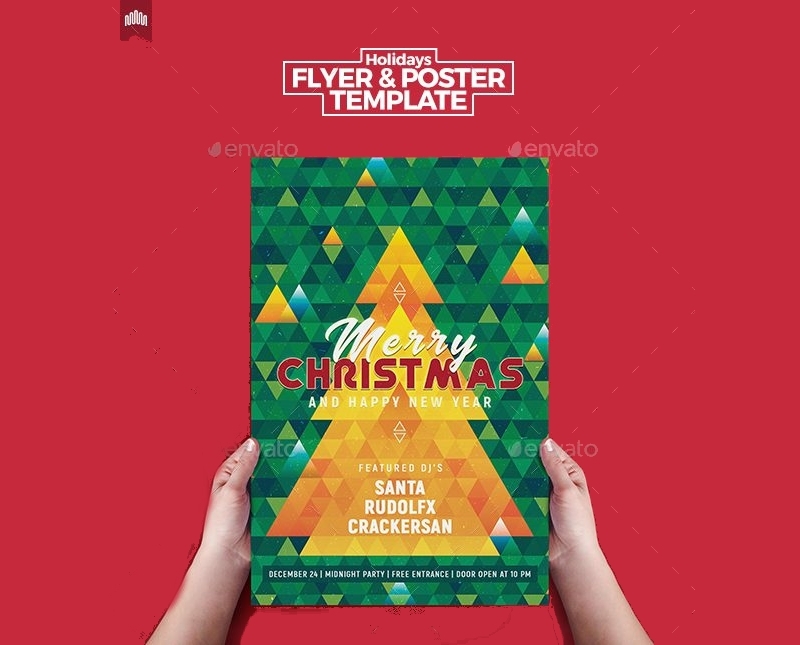 Make sure you use Christmas imagery well and do not overwhelm your layout design with a lot Christmas imagery since that can be cringe-worthy to the receivers and readers of Christmas party flyers. However, you can always do away with the usual Christmas imagery and make one of your own as long as you add on the festive vibes and you can always uplift the holiday spirit. Your over-all layout consists of your typography, imagery, and colors and of how you have blended and incorporated it together. You can always grab the attention of your audience if you have excellently combined all the elements needed for the layout of your Christmas party layout. You might think that the use of Christmas party flyers can be outdated and that people would just throw them away right after being handed one. 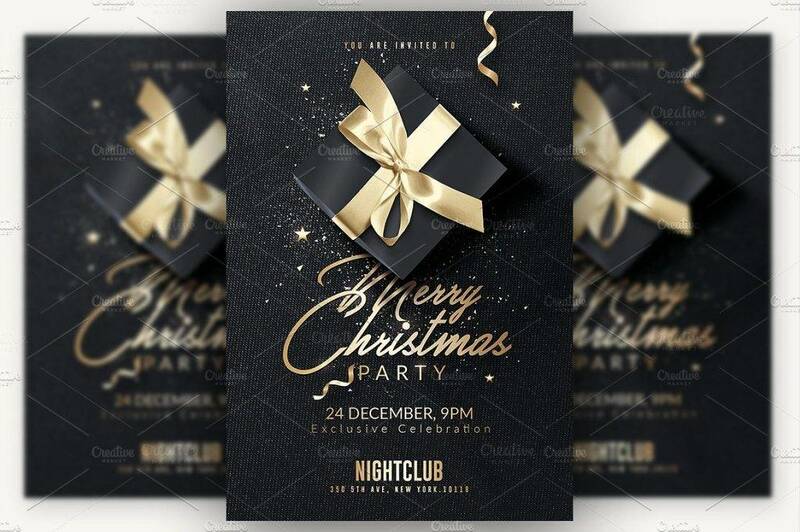 Knowing that fact, all the more that you should work on the design of your Christmas party flyers so that people who will be receiving it will be keeping your Christmas party flyer like that of a souvenir they would like to preserve. 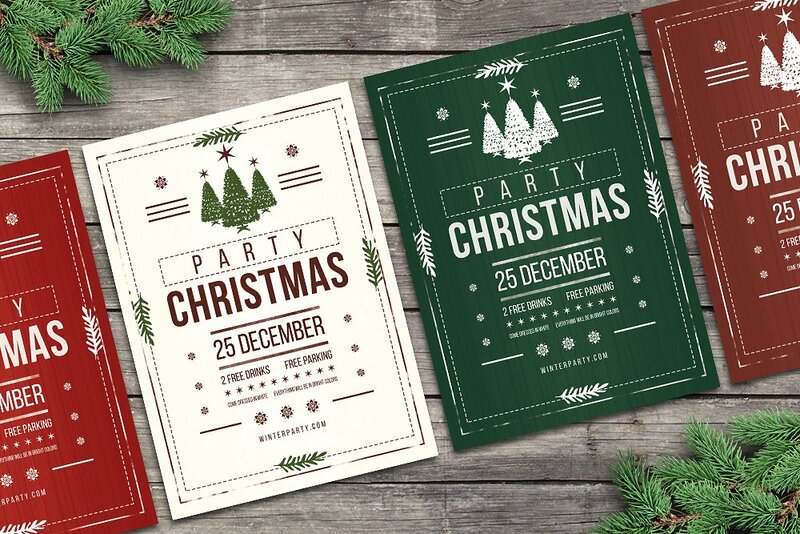 Aside from that, here are five other reasons why you should be using a Christmas party flyer to spread the word about the Christmas party that you are going to celebrate. 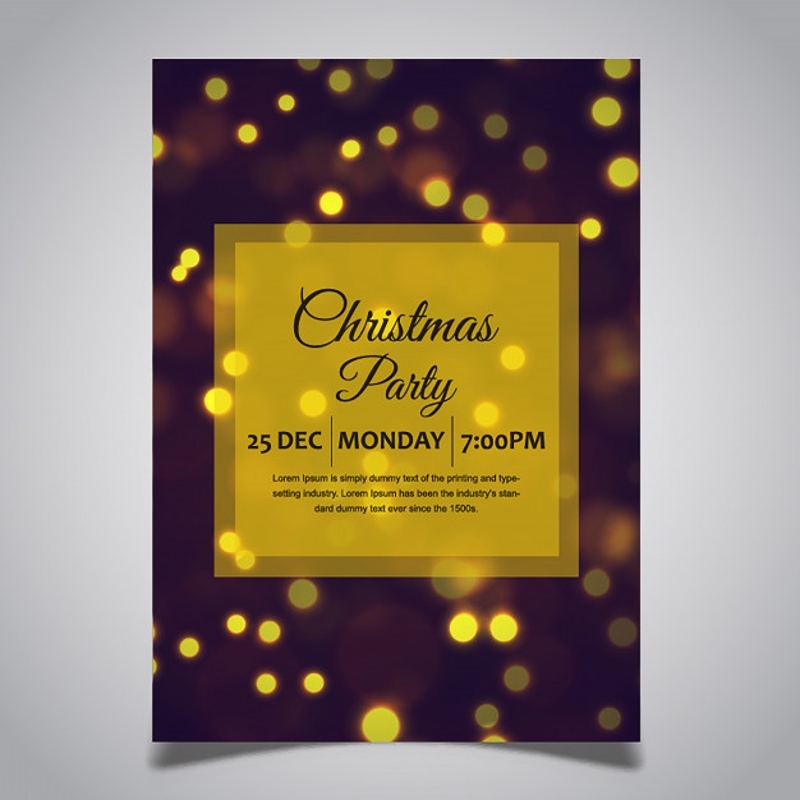 Sure, a digitized form of a Christmas party invitation can still reach your target audience. However, there are chances wherein your target audience would not be able to read about it. For example, you posted a party invitation on Facebook and that you intend to let your family and your real life friends will be able to read about it. There is a feature on Facebook wherein you are only able to see on your news feed the updates from people you frequently interact with. And those people you frequently interact could not be your intended party attendees. Sure, you can just chat your friends and family but where’s the creativity in that? It can be a practical way since you would be able to exert a lot of effort, time, and resource. Christmas only comes in a year and wouldn’t you want to make it more festive by making it memorable? Giving out Christmas party flyers can be memorable to other people. 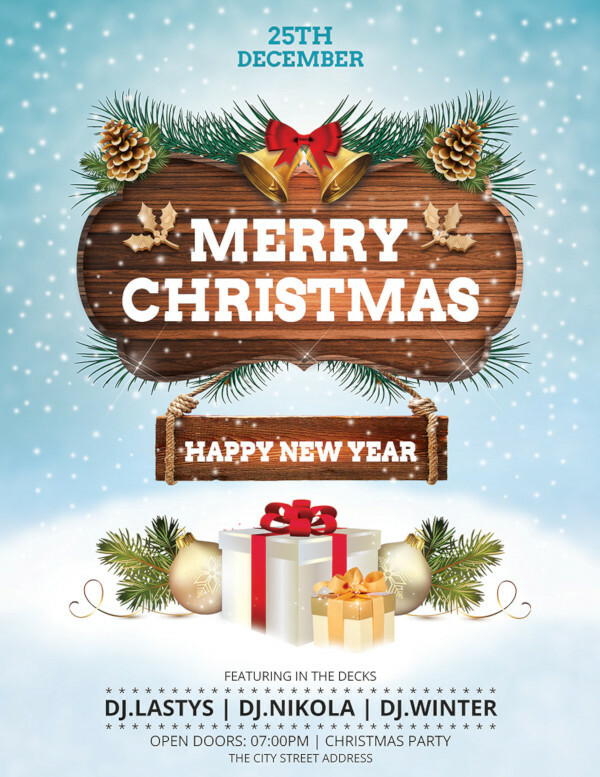 Can you already imagine that if you would be giving out Christmas party flyers this year, people would still be able to remember that you’ve handed out beautifully designed Christmas party flyers on the next Christmas to come? 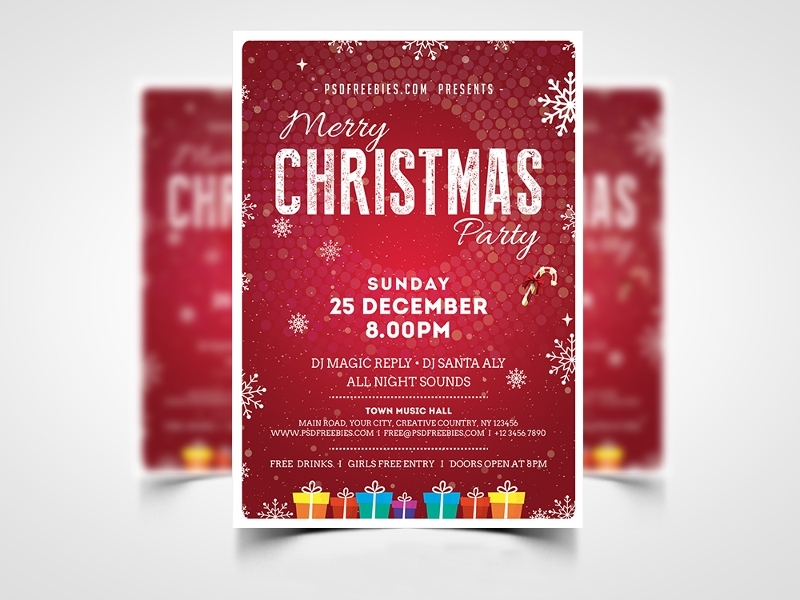 Whether you own a restaurant, bar, pub or you’re just casually holding a Christmas party for your family and friends, creating a Christmas party flyer will enable you to practice and showcase your creativity in other fields aside from your current profession. 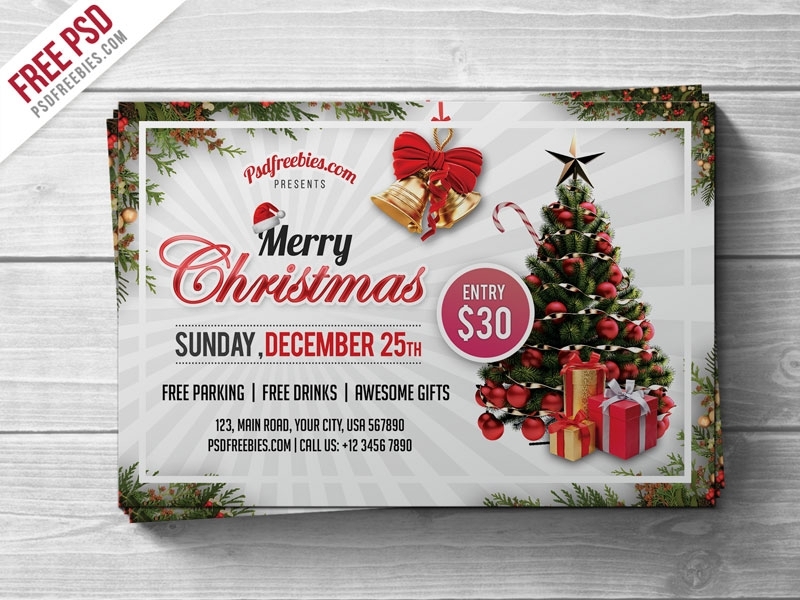 You will be able to practice your creativity with the use of a Christmas party flyer especially if you would be hands-on in the planning example as well as the application of your design. If you own any business, you can make use of it as a way of marketing your business. 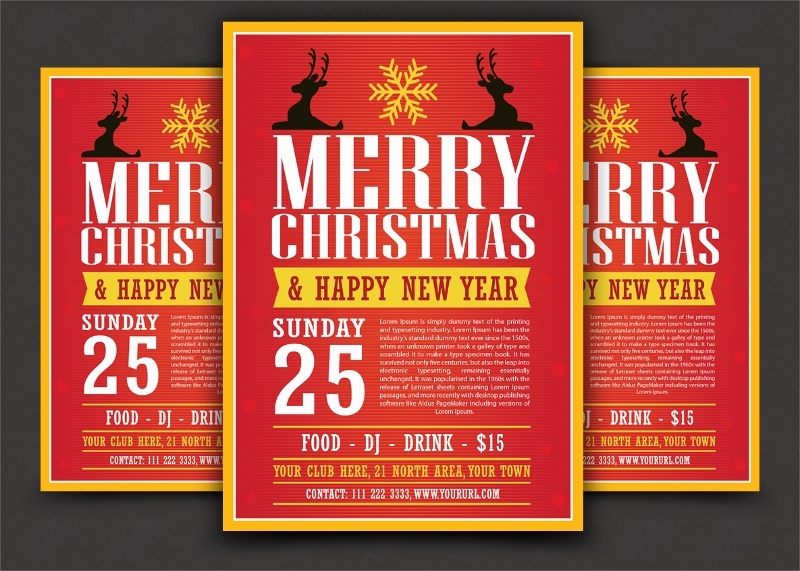 Particularly in a hotel, restaurant, cafe or any food and beverage serving business, you can surely gain more customers that what you intend to with the help your Christmas party flyer. Paired with the perfect Christmas party theme, your business is in for some boom in its profits. 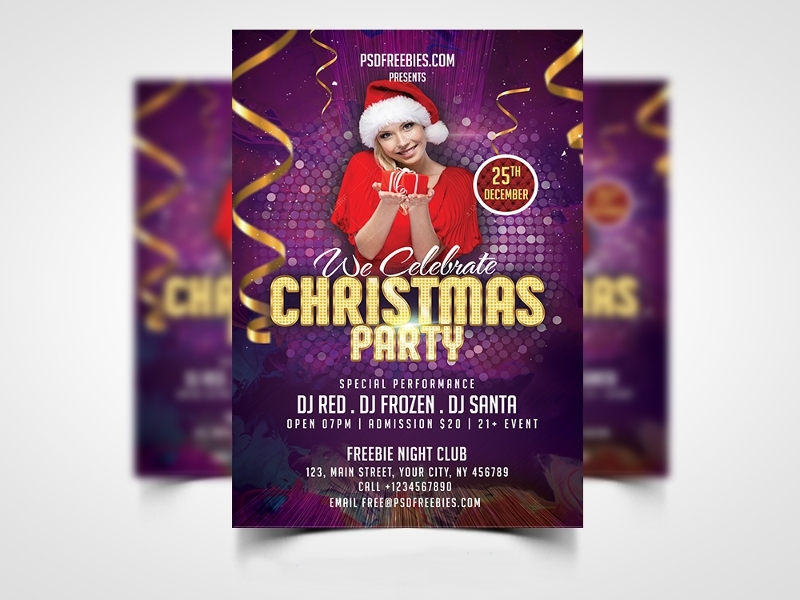 If you are just casually holding a party for your family and friends, inviting them with the use of Christmas party flyers will enable you to showcase your creativity. And who knows they know someone who could help you in developing or even in making a profit out of your skill in graphic design? 3. 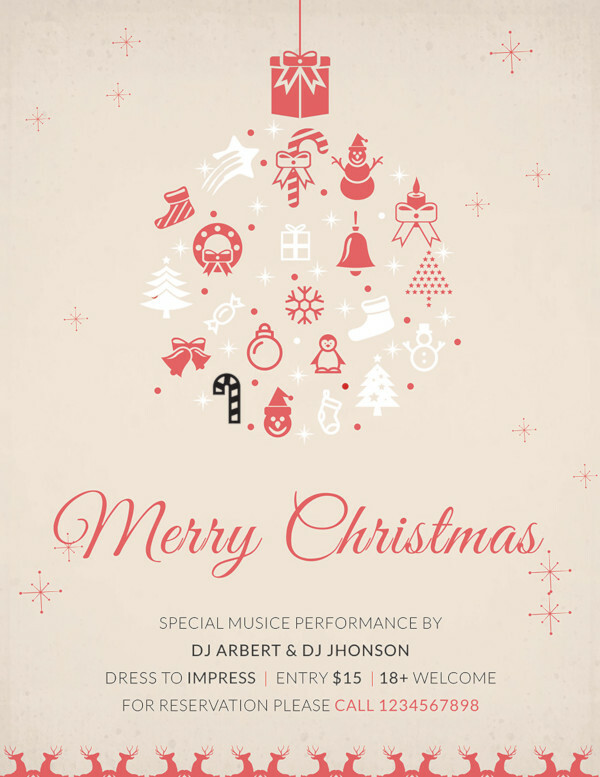 Compared to digitized formats, a Christmas party flyer is more tangible. Tangible means that it is perceptible to the sense of touch. Your intended attendees will be able Another big benefit of using a flyer to promote an event is its tangible nature. The fact that your customers will physically hold the flyer means you are halfway to getting your message across. How your flyer is designed and printed can impact whether or not your customer decides to read on to find out more information. This is why it’s important to make your flyer stand out but also ensure your main message is clear and easy to see. Flyers also allow you to benefit from a quality print finish which can make a big difference when it comes to your customer grabbing it to read.